It’s not me making that decision — it was a panel of illustrious judges who convened last month to sample over 150 entries for this year’s Grand Prix de la Baguette de Tradition Française de la Ville de Paris. It was just delightful timing that the news of this year’s winner came shortly before I left, so the winner was quickly noted on my to-do list for time in Paris. 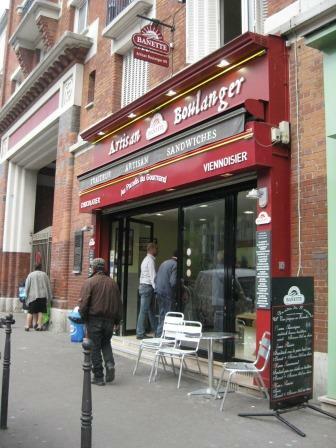 And it’s where the day began today: 156 rue Raymond Losserand in the 14th arrondissement, Au Paradis du Gourmand. Honestly a pretty average looking bakery, you wouldn’t walk by and say “wow, this place must be special!” But it is. Way the heck across Paris, we took a long metro ride to get there and hunted down the address. Got in line, bought “une baguette” and we were out on the sidewalk nibbling at it, sniffing the bread, taking a photo or two. Then out walks M. Ridha Khadher himself, who I recognized from photos online, a quick “félicitations!” to him and we began chatting. What an incredibly nice man, super impressed with his congeniality and comfort in spending a few minutes with us despite being a new superstar. His face still beams, and I confirmed with him something that I’d read, that his decision to enter this year was really a last-minute decision on his part. Lesson for life: you can’t win the prize if you don’t join the game. After a quick photo, he glanced down at what we’d bought and said “that’s not the right one.” We’d bought the everyday baguette. The one he’d won the award for is his baguette à l’ancienne. So back to the counter, with him calling over my shoulder to the clerk, “get one of the warm ones from the back.” So while it seemed silly to have just purchased 2 baguettes, it in fact was a great way to appreciate even more the quality of his winning entry. Much more full in flavor, has a sort of yeasty-earthy character, nutty dark crust, dense crumb with irregular big holes scattered throughout. 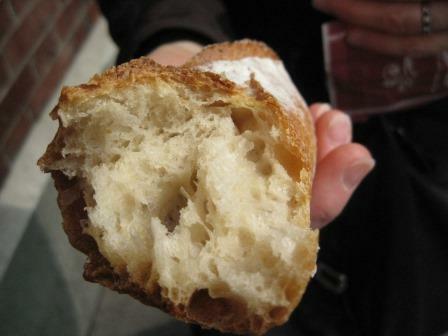 This post on Paris by Mouth offers an awesome overview on the judging process and what exactly makes the best baguette. Later, picnicing with our bread haul and some cheese picked up along the way, I had to admonish my sister for sharing with the birds crumbs of the ancienne bread when we had plenty of the other stuff still. The birds didn’t care. 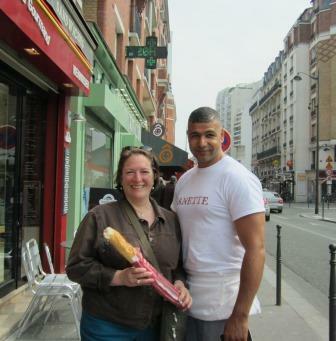 So, it was a delightful experience to not only get to taste the recently chosen best baguette in town, but to meet the artisan himself who is behind the win. Our chat was brief, however. He motioned to his cell phone when we started talking, noting that he was due to be getting a call any minute from the President of France. Part of his honor for the win includes being the official source of baguettes for l’Elysée, the French equivalent of the White House for a year. So M. Khadher is going to be a busy man for the coming year. But he sure is a happy one.